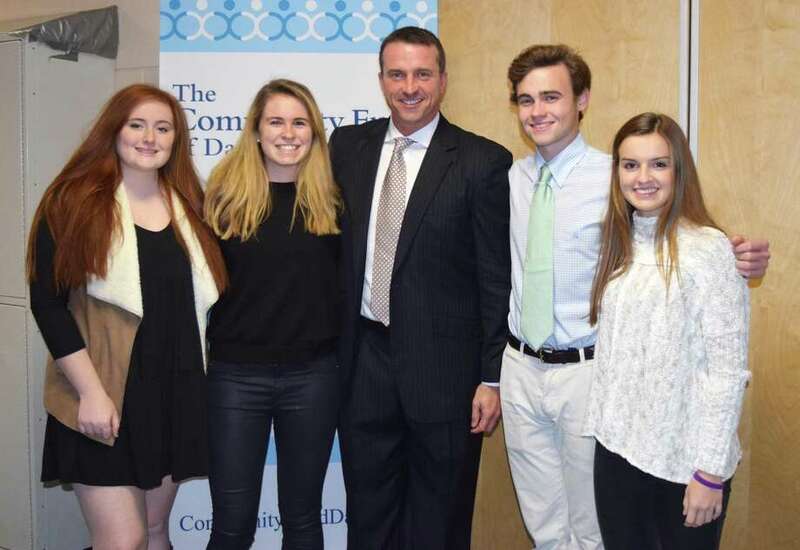 Chris Herren, a former NBA star and recovered addict who spoke at Darien High School Nov. 30, poses with Youth Asset Team Presidents Olivia Taylor, left, Emma Dahlquist, Will Harman and Sydney Schrenker. For over 15 years, the Garden Club of Darien has put their creative floral talents to work by creating holiday arrangements for the recipients of Catholic Charities’ Meals on Wheels of Lower Fairfield County (MoW) program. As part of an annual project dubbed “The Holiday Greens Workshop,” more than 60 helpers got together in early December at the Darien Boy Scouts Cabin to put together the arrangements. The club assembled the greenery, tiny ornaments, shimmery wire ribbon and other festive “bling” to produce 300 table top designs for the elderly homebound. The holiday gifts were delivered the next day by the drivers of MoW. The Tree Conservancy of Darien recently celebrated the significant milestone of installing over 600 trees in town at its year-end board of directors meeting Dec. 5. In addition to reviewing agenda and budget items for the coming year, the local nonprofit also welcomed two new members to its board. Since its inception in 2010, TCD has planted trees at Interstate 95 exits 11 and 13, the Darien train station, Ledge Road, Darien town beaches, Spring Grove and Veterans cemeteries and Town Hall. It has donated trees to all of Darien’s public schools, Post 53, the Darien Community Association, the Bird Sanctuary at the DCA, First Congregational Church, the Darien Nature Center, Selleck’s Woods, Olsen Woods, the Beautification Commission, Tilley Pond Park and the Center Street north and south parking lots. Its most recent installments in the fall of 2017 include 138 trees and shrubs at Tilley Pond Park, Weed Beach, Veterans Cemetery, the Darien Police Station, the Center Street north parking lot and the Darien Community Association. Additionally in the past year, TCD hosted two forest bathing walks, co-hosted an educational lecture at the Darien Library and sold over 90 trees in its annual tree sale. Its committee members have also walked various streets in town with Eversource officials, helping to reduce the number of trees slated for removal along power lines. New board members Jimmy Ma and Sara Zagrodzky, both of Darien, were welcomed to the TCD board at the year-end celebration. They will join current members Sig Buchmayr, Diane Farrell, Joanne Gabriel, Karen Hughan, Eileen Montellese, Ginger Morgan, Gwynne Tibbetts, John Wilson, board president Sabina Harris and adviser emeritus Cindy Ryan in working toward the goals of the group: educating the community about the value of trees and their care, replacing trees lost to disease, construction and storms, maintaining the care of new and existing trees and building partnerships with town organizations. In December, blood donations decline but the needs of patients remain steady. To encourage donations, all those who give blood or platelets through Jan. 7 will receive a long-sleeved Red Cross T-shirt, while supplies last.